I'd been holding this magnet that I think I picked up at BEA for ages, figuring I'd use it for the Much Ado magnet post...but then they had that gorgeous David Tennant/Catherine Tate magnet. 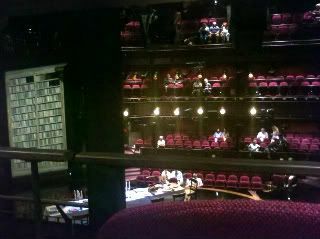 So instead, I'll use it for the Royal Shakespeare Company's production of The Winter's Tale that I saw over the weekend. The RSC is visiting this summer, and have taken over the Park Avenue Armory - and when I mean, taken over, I mean, they up and built a whole darn theatre inside the giant hall. Built to mirror their home theatre in Stratford-Upon-Avon, the Armory theatre is seriously three to four stories, with a stalls level, mezzanine and balcony. It's amazing. Mind you, it's hard for the oldies to get up and down off the barstool like seating in the mezz, but it's really very clever. And I've never seen such a nicer crew of ushers, even as some of the oldies were crotchety to them. The Winter's Tale production itself was both simple and complicated, with moments of craziness that freaked me out a bit, intertwined with some chuckleworthy moments. But as with most productions, I like to go into the theatre knowing as little about the production, the story or anything. That includes the reviews. In fact, after I finish writing this magnetpost, I'll go check out the NYTimes review. This ignorance can sometimes be a blessing and a curse. A blessing, because I go in with a clean slate, not knowing if I'll like it, not predisposed to someone else's opinion running around in my head. A curse, because if I've never read the play or seen the movie, then I have absolutely no idea what the story is about. I won't lie - I've never read the play, all I know is that it's the title for one of my fave Dawson's Creek eps ever. (Points if you know what episode that is.) But, as I watched this story of one man's jealousy destroying his family and kingdom, I realized it was not for me. No matter how well acted or produced, or how terrific the production is...or even if they had a bear (yes, a bear), I just did not like the story at all. No surprise there, I think I may just be destined to not like Shakespearean tragedies. Maybe wanting happy endings makes me a simpleton, but I can live with that. Nonetheless, if you get a chance to see the RSC this summer at the Armory - do it. So. Very. Cool.